First I have to say no gift is possible without good friends and a great desire to share. A few months back I had the pleasure of working with Ray Evernham and his people at IGNITE, a community center in Davidson, NC for young adults with high-functioning autism (HFA) or Asperger's Syndrome (AS). I donated one of my license plate guitars to to be auctioned at their fundraising event in 2014. When two people raised the bidding on my Brad Paisley license plate guitar to $5,000, I agreed to make a second piece if both bidders would donate $5,000 each. It was such an honor to help raise money for this important cause. The second guitar would be a custom piece, created as a gift for the very generous client who was not in the room but made the donation. I always need the help of others to create a piece for a special person, I have to thank Dale Ledbetter for letting me pick his brain. This is the process that makes the gift special. This would be a gift for a man who has everything. I wanted to make sure I wasn’t creating something he already had. That is no easy task, as the gentleman owns the greatest collection of guitars I’ve ever seen, as well as the world’s largest collection of classic Corvettes. Dale invited me to see these collections. I was in awe. During the interview, I asked Dale which car was my client’s favorite. He showed me a Black 1967 Corvette Stingray 427 with a white stinger down the hood. I used license plates to spell out 1967 for the year and 427 for the engine at the top to represent the keys. 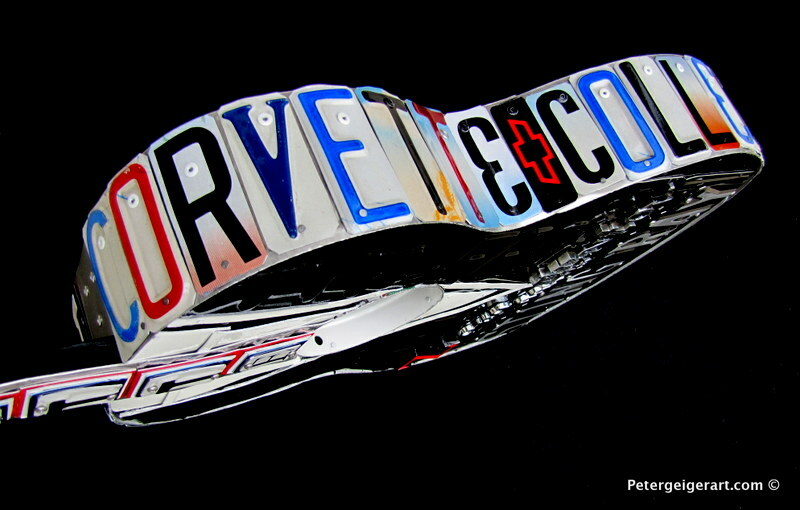 I spelled out CORVETTE down the neck with vintage tags with a red, white and blue underlay to give it the classic Chevrolet feel. The body and hood stinger is created from license plates that are sculpted and shaped to resemble his favorite car. I used a 1967 Corvette gas door with the crossed flags logo -- one of the iconic parts of the car -- in the center hole. The original Corvette designer, Zora Arkus-Duntov, is featured on the guitar body, as Dale explained our client was very fond of him. I used vintage General Motors emblems to spell out his name at the bridge position. At the bottom of the piece I wrote out STINGRAY in license plates to complete the face. Around the outside of the piece I spelled out "worlds Largest Corvette Collection. Its on of the clients many distinguished accomplishments. I would like to thank everyone who helped make this piece so special.